This course was held as part of the ACM Computer-Human Interaction Conference CHI 2017 Wednesday May 10th, 9:30am in Denver, Colorado. Thanks to everyone who joined in and made the day a success! Any move towards a future in which technologies genuinely improve our lives requires that those technologies respect, and even foster our psychological wellbeing. Currently there is no systematic integration of wellbeing science into the technology development process but this is changing. Just as the field of ergonomics investigates design that supports physical wellness, we can now design for digital experiences that support psychological wellness. 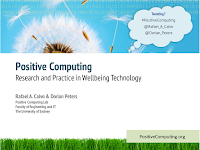 By turning to well-established methods in psychology, neuroscience, and behavioral economics, we can design and develop new technologies in a way that fosters psychological wellbeing and human potential -- an area of research and practice we have referred to as “positive computing”. In this course we will introduce practical methods for evaluating and designing for wellbeing determinants like autonomy, competence, connectedness, meaning, and compassion, as a first step towards a future in which all digital experience supports flourishing. What is wellbeing really and why design for it? What is positive computing? Wellbeing sciences in a nutshell. Speed dating with key wellbeing researchers and their theories. What are wellbeing determinants? Part 2 - How to design for wellbeing. Frameworks and tools as ways of thinking about the wellbeing technology space. Case studies through the lense of each framework/tool. Who measures wellbeing and how do they do it? The importance of valid measures, evidence-based theory and multidisciplinary collaboration. Case Studies. Groups brainstorm ideas, analyze stumbling blocks, and suggest evaluation measures, based on wellbeing determinants (with shared worksheet). Wrap-up, future directions. Theoretical foundation – An understanding theories and evidence from multiple disciplines that can inform the design & evaluation of technology that supports wellbeing. Practical frameworks for integrating psychological wellbeing into planning, ideation, analysis, and evaluation of new technologies. Scenarios and case studies that provide examples of the ways technology use can impact wellbeing including technologies specifically designed to respect psychological needs. Dorian Peters is a designer and author who specializes in design for wellbeing and learning. Creative Leader at the Positive Computing Lab and UX Specialist for the Brain and Mind Cetre, University of Sydney, her books include Interface Design for Learning (New Riders) and Positive Computing (MIT Press).